I finished the Honeycomb Vest on Saturday night. 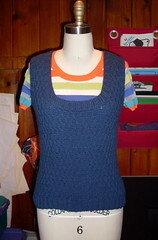 I love the texture of the stitch, the deep neckline, and the subtle shaping too. I hope to be able to get a couple of wearings out of it before the summer weather hits. Very pretty! I love the color and texture.